The NIU School of Music will host an “Organ Extravaganza” this spring, beginning this month and continuing with three concerts in April. Matthew Doran will perform Samuel Barber’s “Tocatta Festiva” with the NIU Philharmonic at 8 p.m. Wednesday, Feb. 24. The program includes works by Bach, de Grigny, Bőhm, Brahms, Franck and Reger. The program includes works by Buxtehude, Bach, Schumann, Messiaen, Demessieux and Widor. The program includes works by Bach, Pärt, Bolcom and Messiaen. 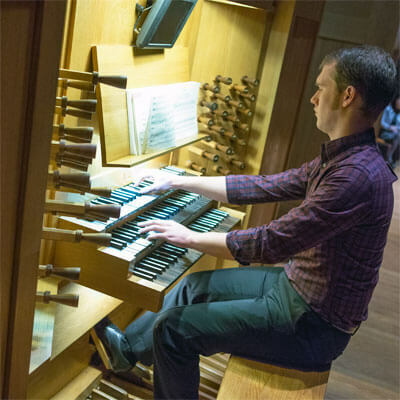 All concerts are played on the Martin Ott organ, Opus 17 (1983), and performed in the Boutell Memorial Concert Hall. The concerts are free and open to the public, and the auditorium is accessible to all. For more information, call (815) 753-7975 or email jbrown35@niu.edu. Next Post:Do you solemnly swear to tell the truth?